Okay, he's arrived a bit late. 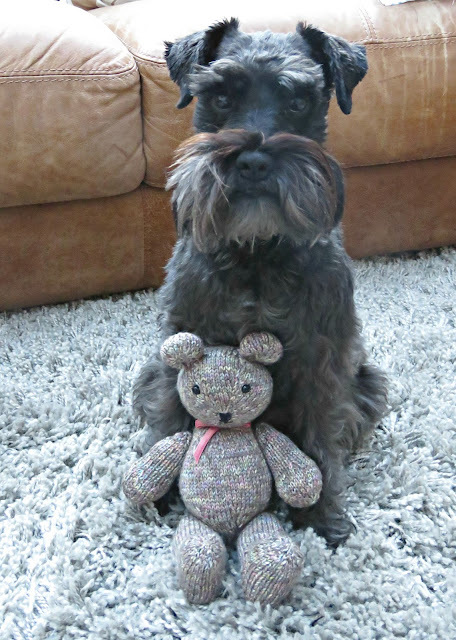 I'd intended to have him off the needles in time for Festiwool, but, with one thing and another, life got in the way and poor Festibear missed his launch date. Still, better late than never, as they say. He can be a Christmas bear. I'm sure there are lots of little people up and down the land who'd happily give him a home for the holidays. He's knit in the round (mostly) from my own-label Costa Brava Knitting Splatter dash Merino double knitting wool on 3.00 mm/ double-pin needles. 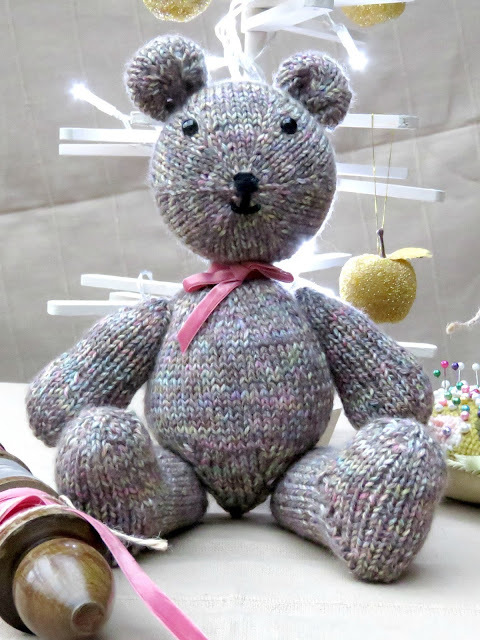 You'll need about 70 g/ 140 metres for a bear of these proportions (he stands 30 cm/ 12" tall). In addition to the wool you'll need a circle of felt (diameter 9 cm/ 3.5") for inside his head to hold his facial features securely in place, some toy stuffing and a pair of 6 mm safety eyes. You may even like to push the boat out and treat him to a nice length of velvet ribbon, just for decency's sake so that he's not a naked bear ... . 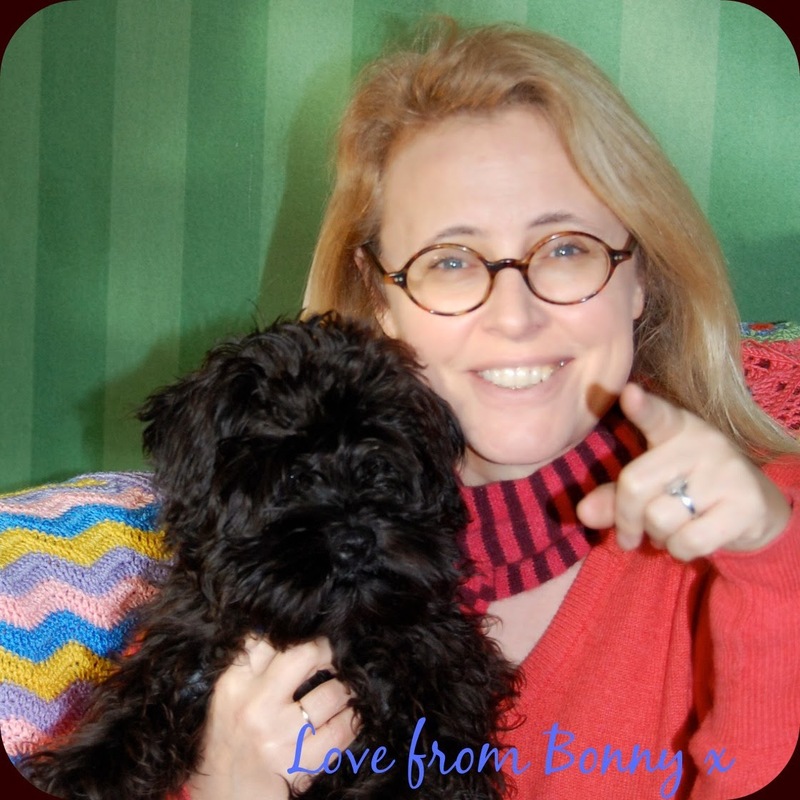 Anyway, whichever way you want to dress him up, please read on for the pattern. T = turn i.e. 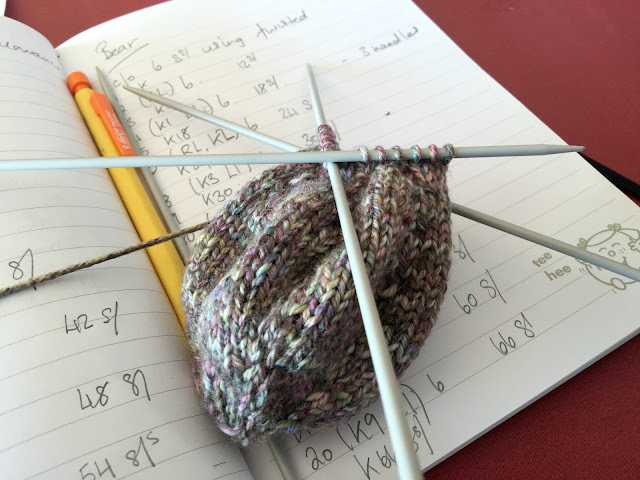 turn knitting around and work back in the opposite direction to which you have been working. W = wrap i.e. slip the next stitch from the left needle to the right needle, wrap the live yarn around it, and slip it back onto the left needle again. Tension: this yarn normally knits to a tension of 21 stitches x 24 rows on a 10cm x 10cm swatch on 3.75 to 4.5 mm needles. However in order to get a nice dense textile I dropped the needle size to 3 mm which knit on a tension of 26 stitches x 30 rows. The head is knit from the front to the back i.e. 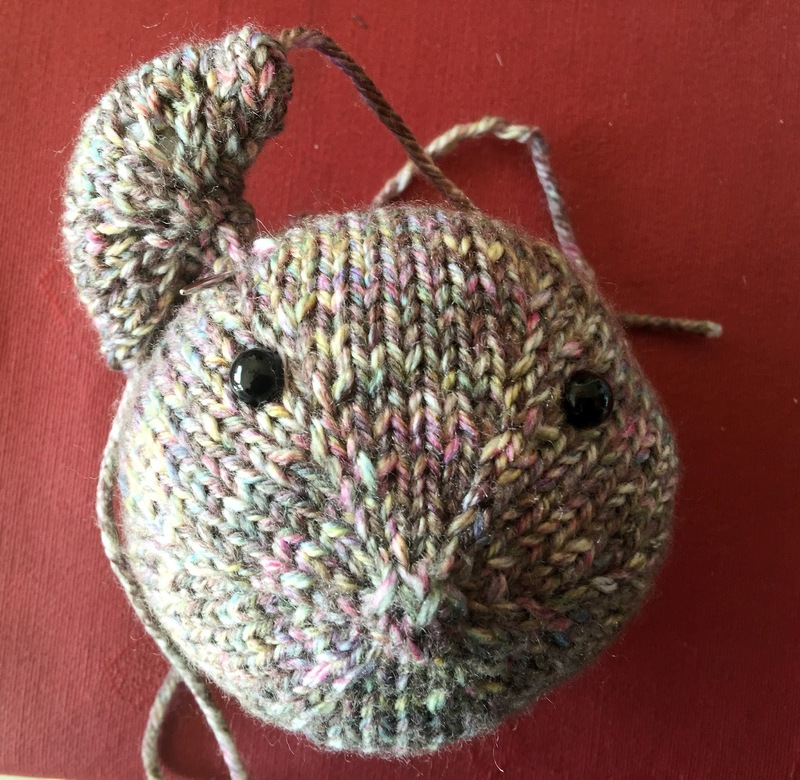 from his nose, which will be where you've cast on, to the back of his head, which will be where you draw the wool through the final stitches on your needles to cast-off and close the knitted sphere that forms his head. Doing it this way creates a nice spherical shape with a texture that radiates out from his nose. Insert the felt circle inside the head, where Festibear's face will be. Stuff his head so that you can appreciate the shape and size of his face. Mark where you think his eyes should be with pins. Insert the safety eyes - you may find this easier if you remove the stuffing and work on an empty head. Push the screw-shaped back of the safety eye through the bear's face and the circle of felt (i.e. from the outside to the inside so that the eyes are on the outside surface, which will form his face). 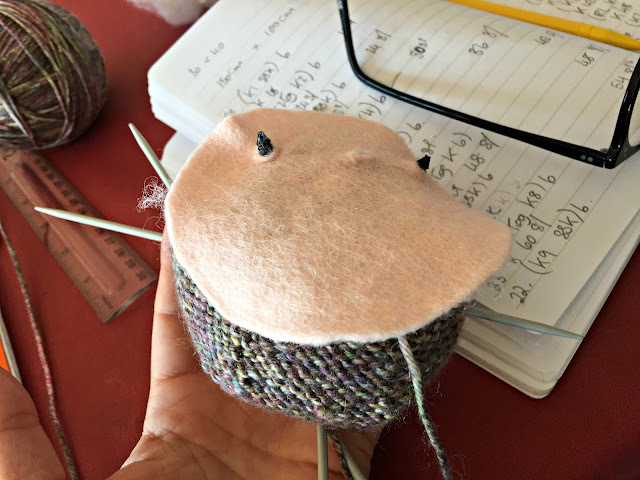 You may need to ease its way through the felt with a small incision depending on how thick it is, but do NOT on any account snip your knitting. 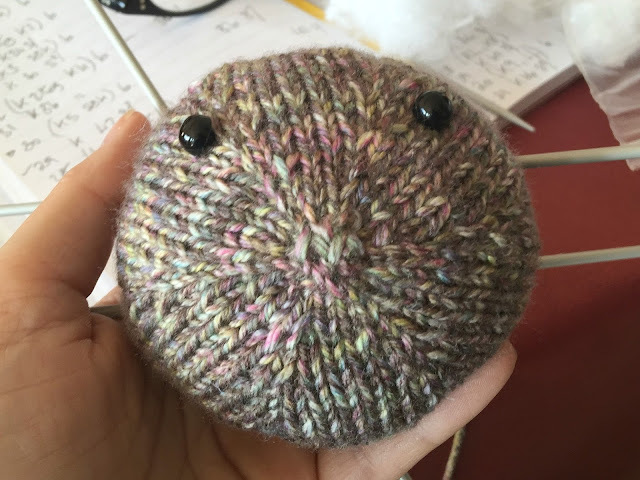 Once I know where the eyes are going I like to turn the whole head inside out so that I can flatten the felt out and make sure that everything fits together properly without any wrinkles or gathers. When you've fastened the backs of the eyes in place, turn the head the right way out again, and stuff it. Check that the head is adequately stuffed - adding more stuffing if necessary. Remember that it should be well stuffed to hold its shape as a perfect sphere. 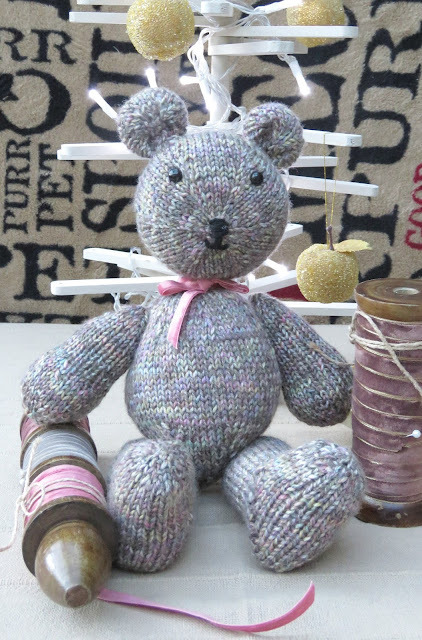 Cut the yarn, and, using a darning needle, draw the yarn through the live stitches to close the loop at the top of the Festibear's head. Fasten and darn in the loose end. Festibear is now a disembodied head. 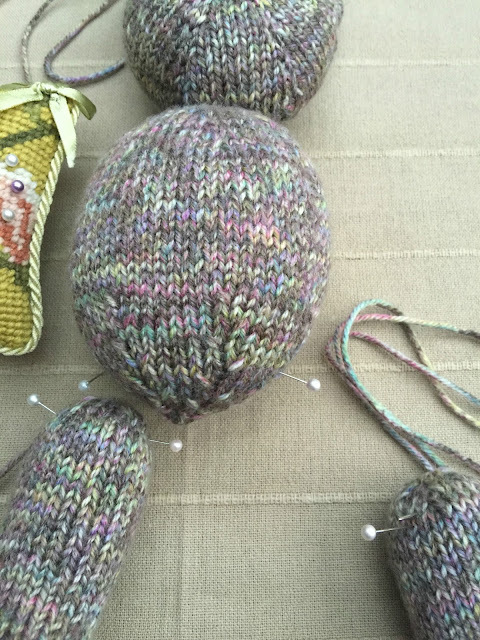 The ears are knit on the flat and then sewn up. Rows 9 to 13: work in stocking stitch i.e. purling the odd numbered rows and knitting the even numbered ones. Row 20: SKPO, K1, K2tog. Fold the ear over and seam along the edges, stuffing it lightly as you go. Repeat and make a second ear. 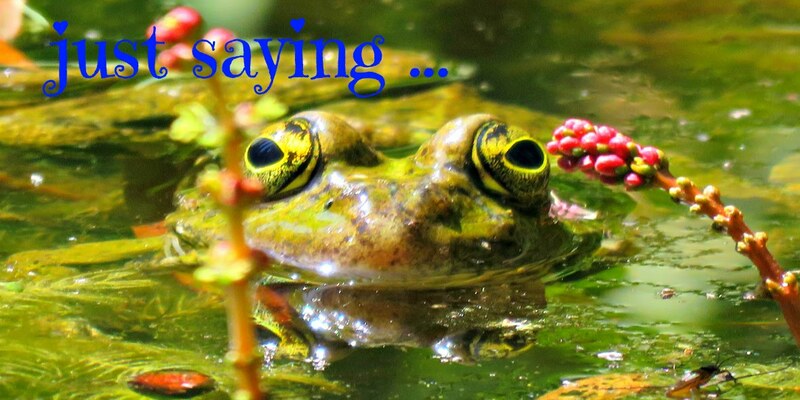 Be careful to stuff both ears so that they are exactly alike. It's the road to madness trying to perfectly match ears (and legs and arms) 😩, but, if you can, try and make them as similar as possible for the sake of Festibear's body symmetry 😜 . Attach the ears to the head, pulling the ends of each ear slightly together so that they cup into the shape of a perfect bear's ear. The body is knit on the flat, from the top down. Rows 15 to 29 are worked in stocking stitch i.e. purl the odd numbered rows and knit the even numbered rows. Row 44: K2tog all the way round (7 stitches). Cut the yarn, and draw it through the remaining stitches on the needles pulling it tight. 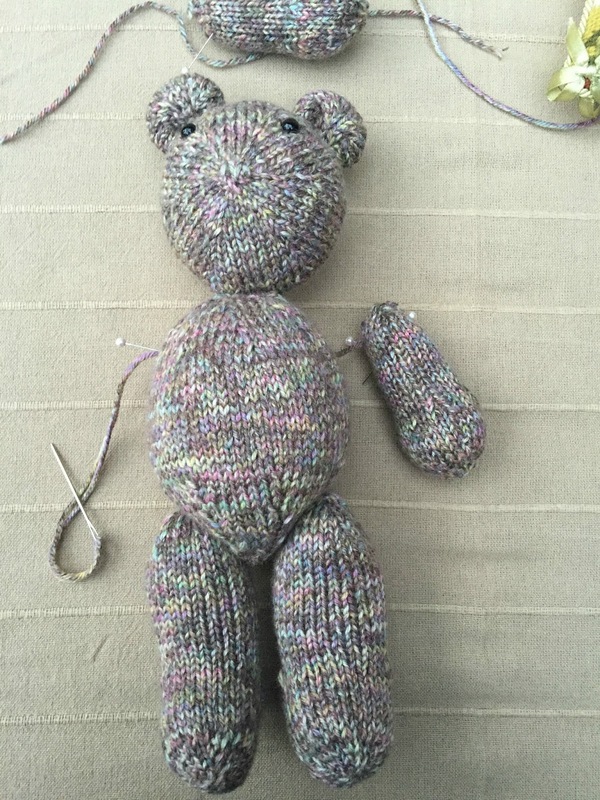 Fasten, and sew up the bear's side seam, and across the top, stuffing as you go. He should be well-stuffed with a proper teddy bear tummy. Remember under-fed is a bad look for bears! Sew Festibear's head to his body, and he will suddenly start to look like a proper bear. 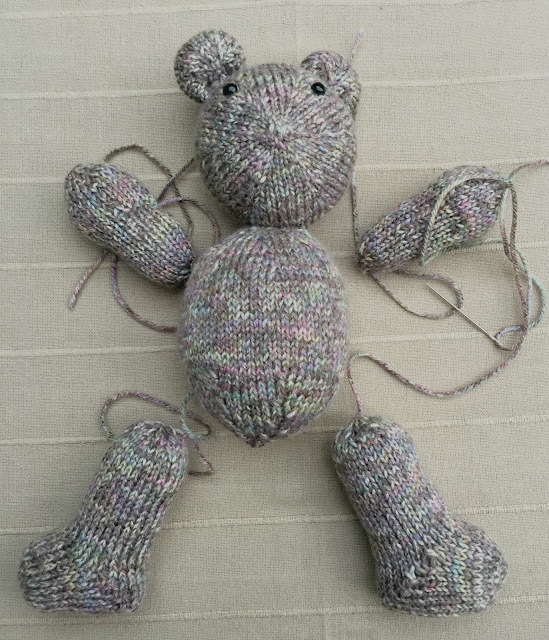 Festibear's legs are knit in the round from his toes up. Cast on 6 stitches using the two needle twisted cast-on method. Row 4: *k1 KFB*. Repeat from * to * to the end of the row (18 stitches). Row 5: k, dividing the stitches over 3 needles as you go so that there are 6 stitches per needle. Row 6: *k1 KFB*. Repeat from * to * to the end of the row (27 stitches). Knit in the round until the foot measures 3cm. To shape the heel we work on the first 14 stitches on the needle. The remaining 13 stitches are held in waiting until the heel has been turned. If your tension is loose you may like to put them on a couple of stitch holders until they're in play again. They will, in due course, be knit to form the instep, the front part of the sock opposite the heel. To begin purl back 14 stitches. Now we’ll carry on and work the other side of the heel, picking up the wrapped stitches, and working them through the back loops so that they lie on the wrong side of the finished work. It's a good idea to start stuffing at this point. We are now going to work the decreases to shape the upper leg, and it's going to start getting more and more difficult to poke stuffing down into the Ted's toes. Cut the yarn, and draw it through the live stitches. 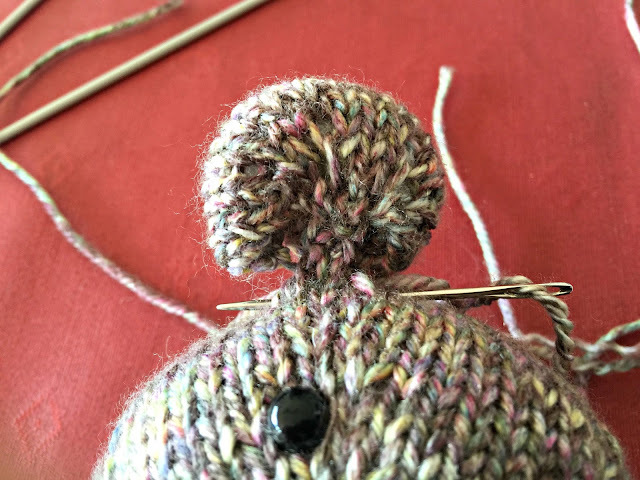 Finish stuffing before pulling the loop tight, fastening and darning in the loose end. 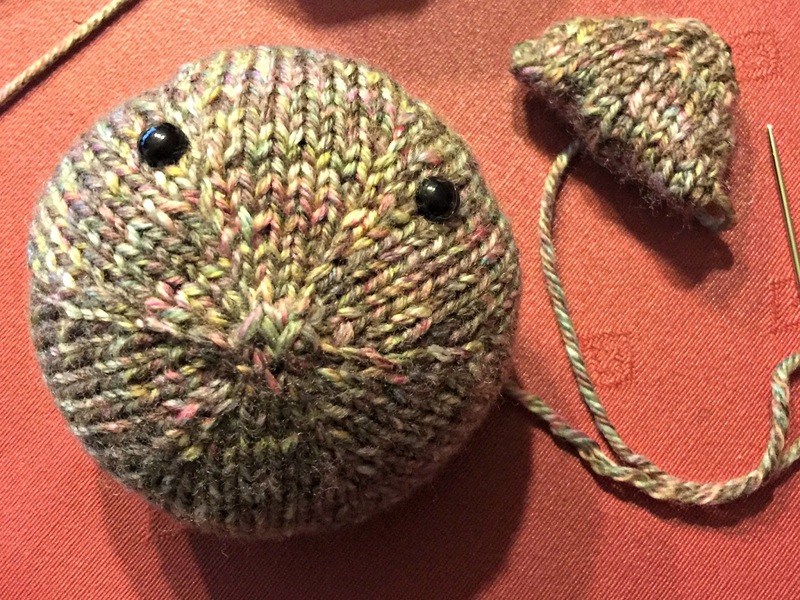 The arms are knit in the round, starting with the fist, and knitting towards the upper arm. Cast on 6 stitches using the twisted cast on method. 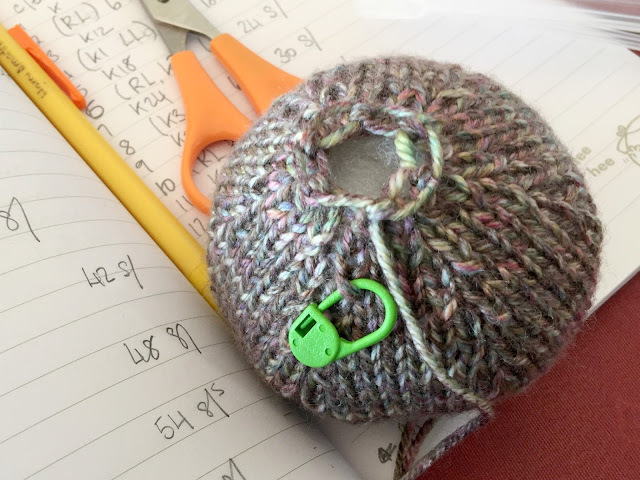 Rows 9 to 13: k.
Carry on knitting in the round until the arm measures 7.5 cm. Cut the yarn and draw it through the live stitches to close the loop on the upper arm, stuffing the arm to your satisfaction before you close it fully. Fasten and darn in the loose end. You will now have a Festibear with a head and body joined together, and 4 limbs that need attaching. Mark each of Festibear's limbs where you intend to draw the joining thread through it to join it to the body. Mark the body also so that you can see clearly where the limb-joining thread will enter and exit the body. Using a long thread, fasten securely and sew through each limb, joining it to the body, and exiting on the other side of the body, joining the opposite limb in the same way. Repeat a few times for security. Fasten and darn in the loose ends. Using a contrasting black wool, embroider a nose over the original cast-on stitches, and give your Festibear a nice, cheerful smile. And - ta-dah! - you're done!